No one will blame you if you get caught up in the chaos that is NBA All-Star this weekend. It’s become a cultural touching point for anyone interested in basketball. It also doubles as an unofficial sneaker holiday. From new albums (hello, Kanye), to sneaker drops, to Kobe’s last hurrah, Toronto is the place to be this weekend. With all that being said, your significant other deserves a little love too, and though Valentine’s Day is often about giving rather than receiving, who says you can’t treat yourself a little bit, too? 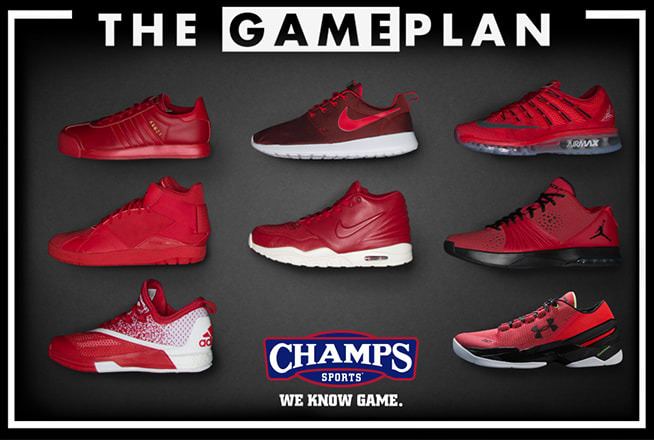 That’s where the latest Game Plan collection from Champs Sports comes in. A “Red-Out” collection of sneakers from many of the game’s most important brands—Nike, Jordan, adidas, PUMA, and Under Armour—this is the perfect opportunity to get in the spirit and rock something with traditional red. The collection brings together a number of silhouettes with a variety of different strengths. For someone looking at a lifestyle shoe they can wear out, there is the Nike Roshe. For someone looking for a boost at the gym, there is the Charged Ultimate Trainer from Under Armour. There’s a little bit of everything, with all of it finished in blood red. This weekend, take in the sights and sounds of NBA All-Star Weekend with something new in the rotation through the latest “Red-Out” Game Plan collection from Champs Sports.